Left: Paul Kent, Trustee of Symphony Nova Scotia Foundation, and his wife, Barbara Kent. Both are long time subscribers, donors, and members of the Legacy Circle. Paul and Barbara have been married for 38 years. When they reminisce, it becomes evident how much energy, dedication, and unabashed joy they’ve put into building their life together. It also becomes clear that music is a big part of who they are and what they‘ve done along the way. Growing up (in Dartmouth and Shearwater), they came from musical households. Both trained as dancers from an early age; Barbara had varied interests (tap, stage, step dancing, Scottish Country, ballroom) while Paul honed his skills primarily as a Scottish dancer going on to perform professionally with the Ceilidh dancers on CBC. They met in their early teens and eventually danced together as competitive ballroom dancers, winning several championships. 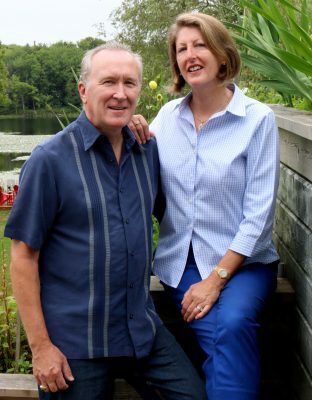 High school sweethearts, they married in 1979, settling in Dartmouth where they raised two daughters and have become extremely active community leaders. Paul’s career has spanned decades with various companies like Bell Aliant, Xwave, and Fujitsu Canada. He retired two years ago as CEO of the Greater Halifax Partnership. A highly-respected business leader, role model, and mentor, Paul has contributed his time, energy, and expertise to a multitude of charitable causes. In 2015, he was honoured with the Red Cross Humanitarian Award. The Kents continue to give back to their community as philanthropists and volunteers. “Music is the most basic motivator,” says Paul. “I can get so emotional about it. I cry over music more than anything else in my life… I spent a year in Toronto in 1978. The open air concerts with the Toronto Symphony, the Mendelssohn Choir at Massey Hall, and the memories of my parents at the piano got me hooked on classical music. In 2001, Paul became the Symphony Board Chair, and he went on to become a Trustee with Symphony Nova Scotia Foundation. He feels strongly about the value of the Symphony and is adamant that its impact goes well beyond the concert hall. Barbara views orchestral music as a unique cultural experience. Paul and Barbara are generous philanthropists; thoughtful about the causes they support and strategic about their about their giving. “Both our parents taught us that it was important to give back. When we were young, we took out a life insurance policy. Our financial advisor showed us how we could support our charities by naming the charities as owners and beneficiaries. We got it all paid off in a matter of about five years or so and then it was done and we didn’t have to think about it anymore. We were both working at the time and the tax implications were significant. For more information on Legacy Giving, call Rose Spicer at 902.421.4402 or email sns5@symphonyns.ca.